White Sugar, Brown Sugar: Interview and Giveaway---Round 2! After my first giveaway last week, I was honored to "meet" Selina Alko (via a comment she made on my blog). Selina wrote a wonderful book called I'm Your Peanut Butter Big Brother, a book we purchased earlier this year that covers the beauty of an interracial couple, their son, and the new baby who is about to enter their family. What color will the baby be? Selina graciously agreed to an interview and, yay!, my second blog giveaway! First, tell me a little about yourself---your work, your family, your hobbies. I'm a children's book author and illustrator living in Brooklyn, NY. I've always been interested in telling stories and making pictures, so creating books for children was a natural path for me. My husband is African American (also an illustrator for kids; Sean Qualls) and our children are biracial. Our 5 year old son, Isaiah, and 2 1/2 year old daughter, Ginger, are both really good at drawing, and I just love that it appears they got our art genes! Originally, I am from Vancouver, Canada, although I've lived in New York for almost 20 years. I feel that I bring a slightly Canadian perspective to my work, in that I have great enthusiasm for everything I do; an optimism that permeates my work and is reflected in my use of bright colors and jazzy juxtapositions. My illustrated books, My Subway Ride and My Taxi Ride are like love letters to New York City. 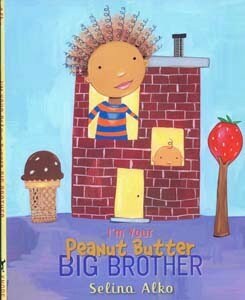 Where did you get your inspiration for your book, Peanut Butter Big Brother? When I was pregnant with my second child I was wondering if my new baby would look like my son (then 2 years old), and I felt that kids of interracial families might have similar questions. So I wrote this book about an older child wondering and imagining what his baby brother or sister might look like. The language is really poetic and playful, which I think kids can relate to. "Will you be my vanilla bean ice-cream sibling, or super rich double chocolate fudge?" is an example of the language used and fun nature of the protagonist's questions. My son, Isaiah, is the protagonist and in the end he is rewarded with his baby sister, who does look quite a bit like her, "peanut butter big brother!" I have two books coming out next year. One is an alternative to the princess pantheon for little girls called, EVERY-DAY DRESS-UP. It's about a girl who dresses up like a different, real woman from history every day of the week. Some of the Icons include: Frida Kahlo, Julia Child, Eleanor Roosevelt and Amelia Earhart. I am also doing my own version of an alphabet book for Brooklyn called, B IS FOR BROOKLYN. It has tons of hand-lettering and fun imagery and is all about my beloved borough here in New York. How can my readers get to know you better? 1: Read over Selina's website and/or blog and tell me (via a comment to this blog post) one thing you love about her. 3: Share with me, via a comment on this post, something awesome about your life as a mother. 4: Publish this giveaway ASAP on your own blog and/or FB wall and leave me a comment telling me you did so. Something wonderful about my life as a mother...let's see. I love going to get L. Baby in the mornings- she get so excited she starts kicking her feet and gets the biggest smile! And I love that L. boy randomly gave me a big hug (big enough he had to close his eyes!) and said "I Love you mommy", even though I was grumpy with him this morning. 1) This book sounds PRECIOUS. And I really would love to have it for our kiddos before baby #4. I love love love the illustrations in Selina's books! So colorful and fun. I am also loving that she is making "adult things" i.e. history, subways, etc. appropriate for kids, because we all know children don't just float through life without noticing, with minds full of lollipops and building blocks. They want to know about the world they live in! Thanks so much for the interview! I hope my book found a wonderful new home with one of your awesome followers.